News - Koch & White Heating and Cooling, Inc.
Koch & White Heating and Cooling is an employee-owned business located in Ann Arbor, Michigan that has been in the HVAC business since 1934. Koch & White services, installs, and maintains HVACR Residential and Light Commercial equipment in and around the Washtenaw County area which currently has a population of over 360,000 people. Koch & White is a family like organization that has 46 members. Koch & White is dedicated to excellence and strives to achieve the ultimate expectations of our customers by continually embracing the ever changing heating and cooling industry through updated technology, self-improvement, and continuing education. 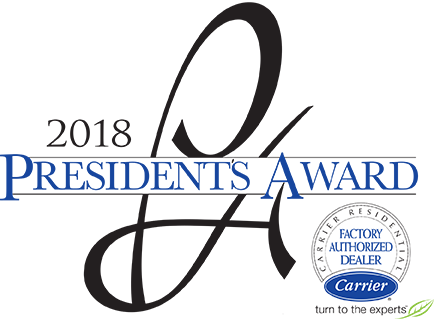 Koch & White Heating and Cooling is honored and grateful to the Carrier Corporation for recognizing and acknowledging the leadership and customer satisfaction that Koch & White provides by presenting us with the 2018 President’s Award. Koch & White and Carrier are proud sponsors of the LPGA Volvik Championship this year. Special thanks goes to Morgan Pressel for playing with Team Koch & White in the Volvik Pro-Am. The weather turned out to be fantastic for the week!